Michael Freedland, author of the new Judy Garland biography “Judy Garland – The Other Side of the Rainbow,” has graciously answered some questions for us about his new book and Judy Garland in general. The book is currently available in the U.K. (click here to purchase) and will be available in the U.S. on April 1, 2011 (click here to pre-order). Thank you Michael for taking the time to answer our questions! 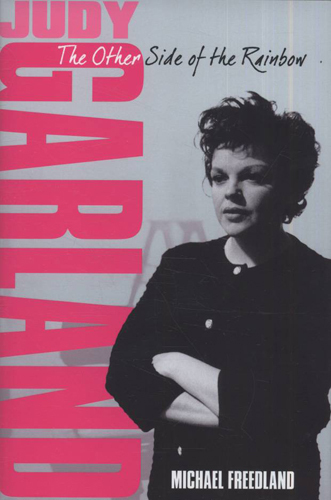 (The Judy Room): Your book is based on research, Garland concerts you attended, and interviews you did for your BBC Radio 2 series, The Judy Garland Trail. How did your interest in Judy Garland come about? (Michael Freedland): I have always admired entertainers of her generation, and before. To me, it was the magic generation. To me, she was one of the great ones who could dominate audiences. Her problem was that there were times when she let down both herself and her fans. The book covers her life from beginning to end. The bright beginning turns into a pretty bleak end. Do you have some kind of explanation to connect the innocent, aspiring Baby Gumm to the erratic, wizened Judy Garland at the end? She was destroyed by MGM. A psychiatrist will tell you that childhood influences your whole life and I am convinced that it influenced hers to an inordinate degree. The drugs became too much part of her life. Hers was the classic inferiority complex – insecurity leading to behaviour which seemed to indicate to those who didn’t know an arrogance and superiority to underlings – and producers and studio executives. What surprised you most in doing the book? The wonderful memories of people who were very close to her – from her babysitter, then 98, to her TV producers and the man who formed her very first fan club. People hated what she did to them on occasion – like Stevie Phillips, who was imposed on her by Judy’s agents as a kind of carer. “Judy offstage was a car wreck,” she told me, recalling the “swill” of Liebfraumilch she bought by the caseload for her and the placebos she had made to replace the pills which she took by the bucket load, and all the attempts at suicide which she herself witnessed. Most amazing of all was the interview I did with the son of the doctor who persuaded her parents not to have an abortion – which would have meant the world would never have had a Judy Garland. There are many recollections and anecdotes in the book that have never previously been published. These add immeasurably to our understanding of Judy. But some might say that stories, even funny ones, about flatulence, addiction and sexual appetite do nothing to enhance her image. How does the biographer choose what to include, and what not to? I am a great believer in telling it as it was. I am very certain of the need for warts and all. How else can you tell a full rounded story? Almost everyone you interviewed for the book speaks about Judy in awe. How do you account for such adulation so many decades after the fact? It is a combination of love, sympathy and understanding to say nothing of admiring, as I do, the way she could dominate an audience – and be so kind to her fans, which she undoubtedly was. You saw Judy in concert a couple of times, I believe. Might you expand on your memories of those experiences? I met her once and saw one concert. I went to that expecting to be in the presence of a genius who was always brilliant – I was very young at the time – a sort of female Al Jolson, with whom she was so often compared. I was more than a little disappointed by the way she was unable to remember the words of her song, kept bumping into the furniture and constantly drank glasses of what she said was water and probably was not. You intertwine Judy’s life and her career. But, are the two related? That is, does one need to understand her life to appreciate her artistic legacy? Absolutely. Her stage appearances were writ-large manifestations of her self. Judy’s life is disturbing. On a personal level, how does the author of a biography feel after completing such a book? Sad, but so glad to have seen and heard her on the screen and on some wonderful recordings. I think I understood her. Do you think the British have a different perception of Judy Garland compared to Americans? You know, that could be right. Everyone I have spoken to in England remembers her so well. In America, I found so many for whom she was not even a name. When people do recognise her, they always say, “Wizard of Oz” or “Somewhere Over the Rainbow”. If Judy were sitting in front of you right now, what would you ask her? Why did you die so young? You had so much still to offer. As your book reflects, Judy’s life was convoluted. Apart a Frederico Fellini or Pedro Almodóvar, do you think her story can ever be made into a motion picture? Yes, I think so. The time is ripe. There are many people who will know the voice but won’t necessarily recognise the face. But it must use Judy’s own recordings. What is your favorite Garland song? Judy enjoyed Liebfraumilch and liked to cook shepherd’s pie. Do you like either? No to the drink. Yes, yes, yes to my wife’s shepherd’s pie. Young people might relate to Lady Gaga or Pink, but what does Judy Garland have to offer young people today? Since I fail to understand why anyone would want to listen to Lady Gaga or any of the other pop idols, I couldn’t begin to tell you. the Judy biopic w/ Anne Hathaway is on hold for now, she said in a BBC Radio interview. rumor has it that Liza, Lorna, and Joey aren’t happy with Gerald Clarke’s ‘Get Happy’ as the source material. I wonder how much, if at all, the estate is involved in the Get Happy film project, except to the extent that using Judy’s voice would involve permission from the estate, which could be requesting certain changes in the script. Thus, the word “sensitive’ in Anne Hathaway’s recent remarks. In any case, this has nothing to do with Michael Freedland’s biography, which deserves reading in and of itself. It contains several reminiscences that had never been previously published. I’m sorry, but doesn’t anyone think that this book sounds just a little distasteful? We know that she had her daemons and off days…but come on mate just because you saw a weaker Judy concert, do you have to tar and feather this great lady. I for one have given these authors enough of my time and money, I accept ” Dark Judy” for her human failings but enough already. I was hoping that the above interview would shed a light on the authors motivations for writing this new portrait I see very little warmth for his subject. The minor characters that he unearths hardly mean a great deal more is to be revealed,just a lack of in-depth research appears more the case. No Mr. Freed land, keep your musings to yourself,and the neophyte fan perhaps you can see if the Clarke, Shipman, Torme book club will have you…?